Channel Kids invites children between 5-10 years to compete in the “Kids Nano Bike Racing” at the multi-purpose ground of Kad Suan Kaew Department Store, from June 3-6. 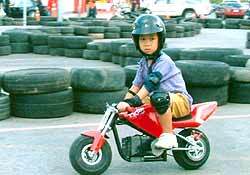 Junior Valentino Rossi on his way to the top. The event will start at 11 a.m. each day. On the first two days, June 3-4, the children will do test riding with instructions on how to ride safely and basic traffic rules. The selection round will take place on June 5, while the final round will be held the next day. The winners will be evaluated against three criteria - ability, appropriateness of clothes, and skills in motocross riding. The champion will receive a 2,000 baht, the first runner-up 1,500 baht and the second runner-up 1,000 baht. All of the juniors will also win trophies and ice-skating coupons worth 500 baht. For more information contact the Public Relations Counter of Kad Suan Kaew Shopping Complex at 0-53 224-444; dial the activity division at 19008 or dial 19012 and 19050. In the last two weeks the farang football team of Chiang Mai, the Farangutans, has crept up to fifth in the Chiang Mai Senior League and is knocking on the Champions League door. On 16th May, a scorching Saturday afternoon, the foreign legionnaires turned up for a game against bottom of the league, Suan Mon Chon. The opposition though - obviously fearing our grizzly reputation - failed to show up. Eventually Suan Mon Chon managed to scrape together 9 players. The farangs generously offered the opponents two of their players even though the referee had already offered the Farangutans a walkover three points. The game got underway an hour late. The referee insisted on keeping the match to 25 minute halves to accommodate the following fixture. The boys from the U.N. Irish Pub were desperate to enjoy a goal fest so they went at their beleaguered foes like a battering ram. Moving Bryan to midfield and Masao to outside-left, the deft tinkering coach employed a 3-4-3 formation, a deadly machine designed to crush the opposition swiftly. The game ended Farangutans 6 - 1 Suan Mon Chon. Scorers were: Mick Davis (2); Bryan Haggerty; Lee Stevens (outstanding header); Leandro; and new signing Dave Percy. Ironically the Suan Mon Chon goal was a dazzling 25-yard drive from our own player-on-loan Rick Mann. Man of the match was Dr Tim Cressey, if for no other reason than his shot from six yards which was goal-bound but for the goalkeeper who was apparently tying his shoelaces, only for the ball to smack against his buttocks and sail over the bar. And so on to Super Sunday, 23rd May. Venue: CMU stadium (a pitch that resembles a newly-ploughed rice field). Farangutans were missing several key players including Cleomar Panno who had skipped town on the feeble excuse that his wife was giving birth to a baby girl in Brazil. Back to their traditional 4-4-2 and a hard game in store against Mae Raming. The farang opted for a right-sided approach to the game with in-swinging crosses from Dave Percy and Dr Tim. The Farangutans defence was in solid formation with Albert Crooks back from exile to link up with Wayne, Lee and Colm. Shawn Kelly ran his wee socks off, Leandro bulldozed his way through on a couple of occasions, James Farrell blasted a chance over the crossbar, but the first half ended goalless. Rick Mann came on for his debut in the second half and quickly fitted in, linking one-twos with Leandro, Shawn and Dave down the left flank. Alas, the enthusiastic newcomer was also booked for a WWF slam-dunk on the goalkeeper. With 20 minutes remaining, another neat move down the right wing was concluded by Dave Percy drilling the ball across the face of the goal. Timing his run to perfection, Amarildo Zampiva pounced like Ruud van Nistelroy and slammed the ball home from six yards. Mae Raming exerted pressure right up to the final whistle, hitting the bar and missing a last-minute penalty. Finally the referee brought the game to an end, much to the joy of the seven supporters (watch out for the Spot-the-Fan competition on our website). Final score: Farangutans 1-0 Mae Raming. Next game is against Lamphun F.C. on Saturday 29th May at 2:30 p.m. at Dr Santi Field, San Patong. All details can be found on our website: www.geocities.com/farangutans or on the notice board at U.N. Irish Pub. For an unforgettable golf holiday, Chiang Mai, Chiang Rai and Lampang provide golfing attractions that belong to the best in the world. If you are in Chiang Rai, you can choose from the following golf courses. Set upon a plateau surrounded by impressive mountains, the 18 hole, par 72, 6,966 yards championship layout is one of the most scenic in the whole of Thailand. Designed in 1994 by Rather International, this golf course has well maintained fairways and greens, with lakes and streams bordering many holes. The weekday green fee is 1,100 baht (weekends 1,650 baht), caddy 200 baht, and golf cart is 600 baht. This golf club is 30 km from Lampang and some 120 km from Chiang Mai. The first nine holes were established in 1984 and a couple of years ago, another nine were added. This par 72, 6,374 yards golf course is adjacent to the famous lignite mines near Lampang with impressive mountains nearby. The green fee is only 500 baht, caddy 160 baht, and golf cart is 600 baht. The well established course and spectacular design fairways make for an unforgettable day of golf. 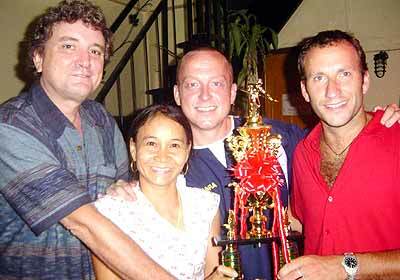 (From left) James Hightower, the owner of the No Name Cafe, his wife, Wanpen Inta (Tai), Mark Fotheringhame and Rick Mann proudly show off the trophy they earned from winning the Chiang Mai Pool League Championship. The presentation was held at the No Name Cafe on May 21. The Chiang Mai ‘Under 13 Squad’ have been training hard in anticipation of the games being played this weekend - 29th/30th May. After Chiang Mai won the National Tournament in February between Bangkok, Petachaboon and Khon Kaen, it was agreed that Khon Kaen (second place) would make a return visit to Chiang Mai. Chiang Mai Schools Cricket Alliance will be hosting the visit. Spectators are very welcome at the Gymkhana Club on Saturday 29th May when the game will start at approximately 11 a.m. Any boys or girls in Chiang Mai, or surrounding areas, who would like to give cricket a try, please contact Linda Buck on [email protected] for more information. The Chiang Mai and Chiang Rai offices of the Tourism Authority of Thailand and the private sector are promoting a “Friendship in 4 countries and with 5 Chiangs” tourism caravan from June 25-30. Thanpa Nikrothanon, director of the Tourism Authority of Thailand, Northern Office, Region 2, said the caravan will go on the Chiang Mai-Chiang Rai-Luang Nam Tar-Chiang Thong (Luang Phrabang)-Chiang Rung (Sib Song Panna)-Chiang Tung (Burma) - Chiang Mai route. It will be held to promote tourism in the Mekong sub-region, with the Upper North of Thailand as the centre, and to link tourist routes in Thailand, Laos, China and Myanmar. At the same time, the trip will help promote Chiang Mai and Chiang Rai as the gateway to Mekong sub-region. This tourism promotion has wide support from Chiang Mai, Chiang Rai, the Committee for the Joint Economic Quadrangle Cooperation, Chiang Mai Tourism Business Association, Thai Hotels Association’s Northern Chapter and the Chiang Mai Guide Association. The caravan will be launched in Chiang Mai, and move directly to Chiang Rai and then on to Chiang Khong district. At Chiang Khong, the caravan will cross the Mekong River to Ban Huai Sai in Laos’ Bo Keo province and continue to Luang Nam Tha, Udomxai and Luang Prabang (Chiang Thong). After that, the caravan will go to Lar, the Laos-Chinese border town, and then to Chiang Rung or Jing Hong (Sib Song Panna) in south China and carry on to Chiang Tung in Myanmar. It will return to Thailand via Mae Sai district in Chiang Rai, said the director. The trip will take all 6 days, 5 nights and throughout the route the participants will face different civilizations, make new friendships and experience the culture of the people in all four countries. People who love travelling and who would like to join the trip should apply to the office of TAT Northern Region 1 (Chiang Mai), tel. 0-5324-8604 or 0-5324-8607 or office of TAT Northern Region 2 (Chiang Rai), tel. 0-5374-4674-5 by May 30. Only a limited number of seats are available.